Updating your holiday decor this year? Start by reviewing these tips for selecting the right string lights for your setup—and don't miss this season's top-rated recommendations. Who hasn’t slowed down to marvel at a house with an especially elaborate display of colorful holiday lights? Or, for that matter, a towering Christmas tree decked from top to bottom with twinkling lights and shiny ornaments? One of the joys of the season is all the opportunities for creative and beautiful displays of holiday décor, and prime among those decorations are string lights. These days, however, the choice of holiday lights goes far beyond the old-style large incandescent bulbs that once graced the Christmas trees and eaves of homes everywhere. You now have a choice of bulb type, a much wider range of colors, sizes, shapes, and even twinkling ptaterns—from a simple on/off alternation to elaborate dancing displays set to music. Read on for an overview of what to consider when choosing your holiday lights, along with three recommendations for the best Christmas lights you can string up this year. Your first decision is where you’ll use the lights. You’ll find three options: indoor only, indoor/outdoor, and outdoor. While it’s generally okay to use outdoor lights inside the house, the opposite is not safe. Never use indoor-only lights outside, where moisture and weather exposure could short them out, creating a fire hazard. Of the three, indoor/outdoor lights are the most practical option if you like to change up your holiday décor each year or don’t want to be bothered separating lights by type. 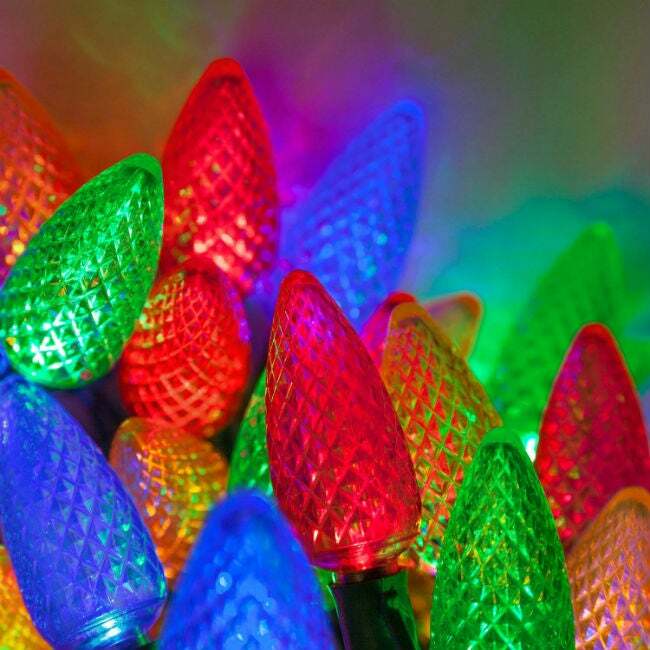 While LED lights have surpassed incandescent string lights in popularity, you can still frequently find a few of the older-type lights on store shelves. Incandescent Christmas lights only have two advantages over LED holiday lights: They are less expensive, and the bulbs give a warm glow that has a vintage appeal. 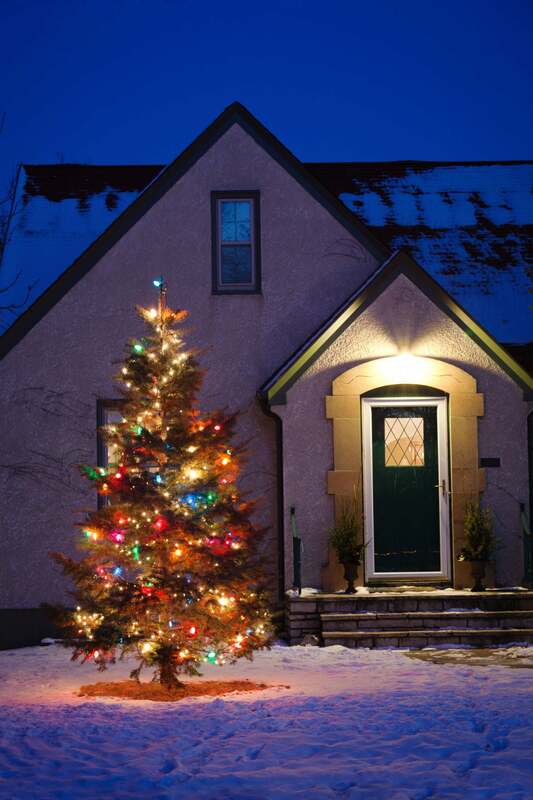 While LED Christmas lights do cost more at purchase—often twice the price of incandescent string lights—you’ll recoup your expense over the next few holiday seasons. LED bulbs use approximately 10 percent the amount of electricity as an equal-size incandescent bulb and last two to three times longer. They also burn cool, unlike incandescent bulbs which can heat up enough to burn your fingers, and feature plastic shells (not glass) that are less likely to shatter or flake off coloring. While the traditional “teardrop” Christmas light is still the most popular, closely followed by round or globe bulbs, you’ll find a wide array of other options. Icicles and snowflakes are fairly common, as are rope lights, which enclose the lights in a clear plastic tube. Shape and size are a matter of preference, so choose your favorite, or mix and match around your home. Mini lights, which work well both on the tree and for decorating small accents on the interior and exterior of your home. Mini lights are currently the most popular size, but as with all fashions, holiday decorating style changes over time, so if you prefer something larger, feel free to buck the trend. These lights are typically ⅝-inch long. C6 bulbs are shaped like little strawberries and are the perfect size for indoor trees. These bulbs are 1⅛-inch long. C7 are a little rounder and longer than C6 bulbs and work well on larger trees, wrapped around stairway banisters, or outdoors. These bulbs are 1½-inch long. C9 are the traditional teardrop shape and size for outdoor décor you might remember from your youth. At 2½-inch long, these lights provide a big impact in outdoor displays. G12 are globe-shaped bulbs that often have an etched design that looks something like a raspberry. They are 1½-inch in diameter and work well both indoors and outside. When it comes to color, some people prefer it pure—all white lights, for example, or alternating two colors—while others prefer a rainbow of hues. The choice is entirely up to you; while traditional primary colors are always popular, you’ll also see colors unheard of in years past, such as pink, purple, and turquoise, along with neon-bright or pastel bulbs. 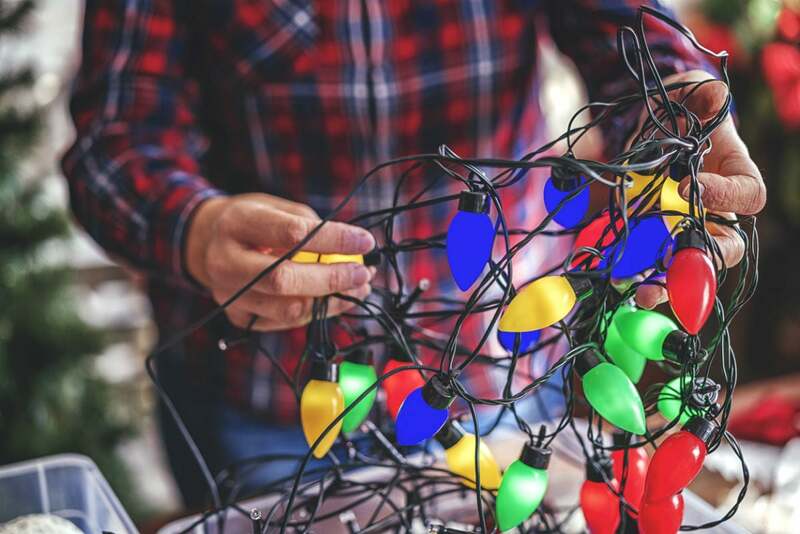 Always check for the length of the overall string, the number of bulbs, and the space between the bulbs, all of which is normally listed on the packaging. String length. While strings of specialty shapes are often less than 15 feet long, the more traditional bulb shapes generally run longer—you’ll find strings as long as 100 feet. Just remember: The longer the string, the more difficult to wind it neatly for storage between seasons. Number of bulbs and spacing. 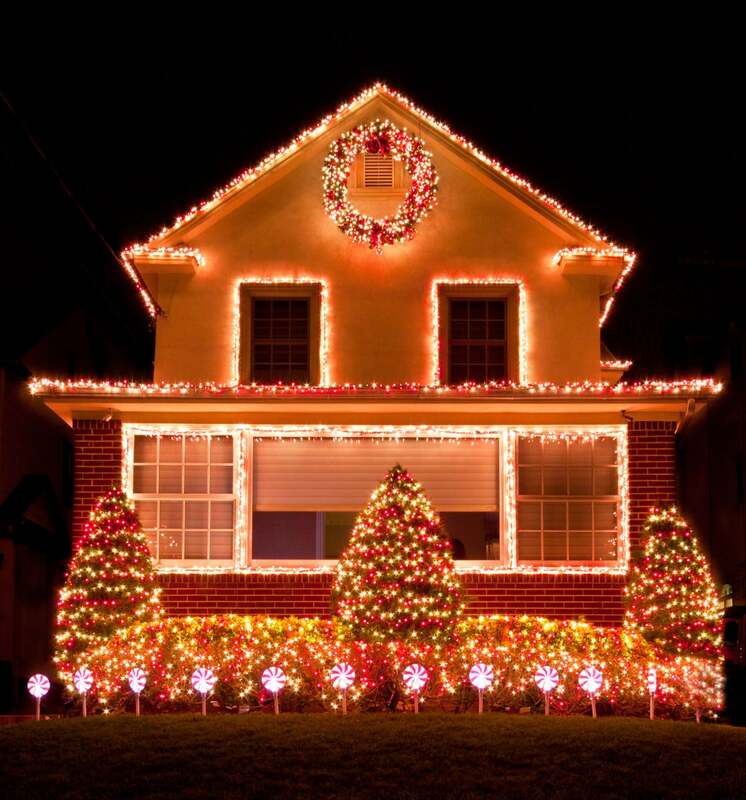 As a rough rule, mini lights are spaced 4 to 6 inches apart on the wire. You’ll mostly find mini bulbs in 50-bulb/25-foot strings and 100-bulb/50-foot strings, although longer and shorter strings are also available. Larger bulbs are spaced further apart; C9 bulbs are often one per foot and often span between 25 and 50 feet long. When decorating your tree, aim to string up 100 lights per foot of tree height. Always round up in length. When decorating other surfaces in or out of your home, measure first. Then, remember to allow for the bare stretch of wire at the plug end—this length will be stated on the packaging—and err on the side of going a little bit longer to avoid finding yourself with another two feet of eaves and only one more foot of lights. Combine string lights carefully. 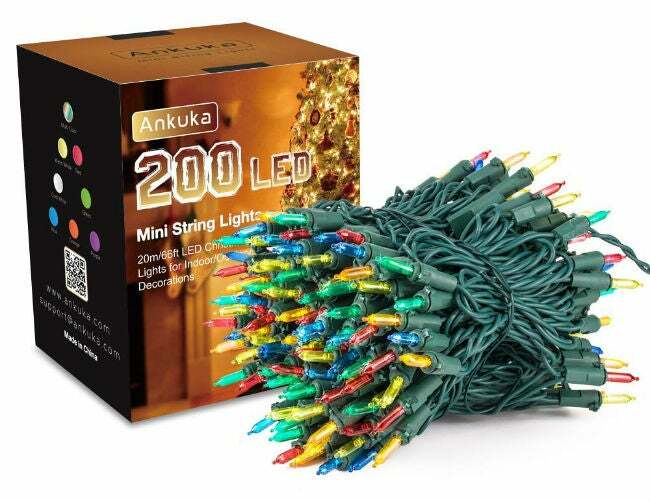 Typically, you can plug strings of lights together to get as much length as you need, but heed the guidelines given on the packaging, which should state how many strings can safely be plugged together. When combining strings, always stick with the same type—don’t plug strings of different lengths or with different size bulbs together. Doing so can overload the wire and create a fire hazard. If you’re covering an outdoor bush, Christmas light nets make the task super-easy. Just drape the net over the foliage, plug it in, and enjoy the festive display. Most nets are 4-foot by 6-foot and contain 150 bulbs, but as with most holiday lights, you’ll find other size options as well. 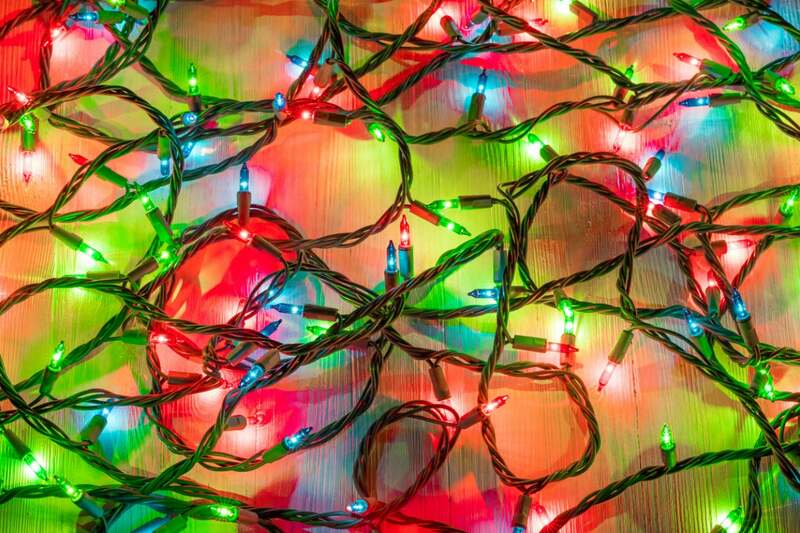 The majority of Christmas lights of all sizes plug into an electrical outlet. But you might prefer to pick up battery-powered strings (which are perfect for spots that aren’t near an electrical outlet) or even solar-powered string lights for use in your outdoor décor—no more running extension cords across the lawn! If a simple row of colorful lights isn’t enough of a splash for your liking, go ahead and take it even further. 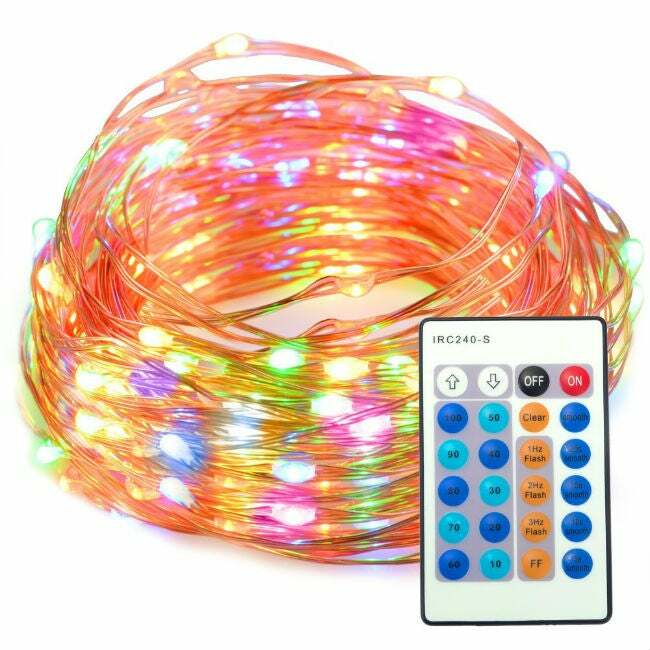 Many string lights have small control boxes with a multitude of settings for light patterns. Some of the most common include blinking, slow or fast fade, sequential single colors, waves, and sequential on/off patterns. If you really want to make a splash, you’ll even find string lights that play music and “dance” the light patterns in rhythm with the tune. There are a lot of options on the market, but the following three Christmas string lights win rave reviews from homeowners.